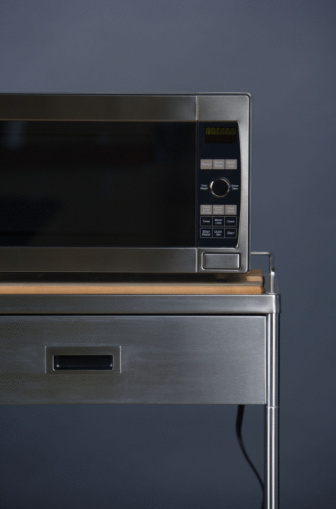 Common error codes found in Panasonic microwaves that may represent operational issues include F44 (malfunction with the microwave's keypad) and F33 or F34 (excessive heat within the oven). If your Panasonic microwave will operate even when the door is open--which creates a safety issue--its door interlock assembly is likely broken. Bring it to an authorized repair center. If the microwave starts operating when you shut the door without pressing the "On" button, try unplugging the unit and then plugging it back in. If your Panasonic microwave works but the display is blank, unplug the microwave and then plug it back in. Otherwise, bring it to an authorized service agent. Some miscellaneous error codes commonly found in Panasonic microwaves include F03/F04 (mismatch between incoming line voltage and the oven's voltage setting) and F86, F87, F88 and F89 (represents shorted contacts within the microwave's boards and power supply). If sparking or arcing occurs when your Panasonic microwave is operating, check inside to make sure there's no exposed metal within the cavity. If possible, remove the ceiling plate and carefully clean any food particles that may be stuck near the antenna. If your Panasonic microwave makes a loud humming noise or generates a bad smell when it operates, clean the interior thoroughly. Make sure no debris are stuck above the ceiling plate and antenna. Otherwise, bring it to an authorized service agent. A Panasonic microwave that doesn't properly or thoroughly heat food requires the attention of a professional repair technician. Never attempt to take apart a Panasonic microwave yourself.